After a colossal work in a highly symbolic place, Russian President Vladimir Putin inaugurates on Tuesday a strategic bridge linking Crimea with Russia with the aim of reducing the isolation of the peninsula that Moscow annexed in 2014. From 19 kilometers long the "Crimean Bridge", crosses the Strait of Kertch, an arm of sea between the Sea of Azov and the Black Sea, and joins the peninsula of Kertch, in Crimea, to that of Taman, in the south of Russia. The head of the Kremlin came to Kerch from Sochi, also on the shores of the Black Sea and where he is these days, and immediately went to the bridge for the official ceremony. Dressed informally, wearing jeans and a navy blue jacket, Putin boarded one of the large Kamaz trucks that participated in the work and sat behind the wheel accompanied by several workers, as it could see live on Russian television. 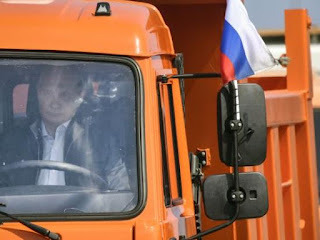 After honking the horn, like the rest of the heavy vehicles, Putin started the truck and drove it along the bridge in the direction of Crimea, leading a long entourage of orange trucks. Before making the tour, the Russian leader first spoke with those responsible for this gigantic work. Moscow awarded the work, begun in February 2016, to the company of billionaire Arkady Rotenberg, a judo partner of the Russian president. According to a decree published on the government website, Stroigazmontaj had to deliver the bridge before December 2018, for a limit cost of 228,300 million rubles (2,900 million euros at the time). But during a visit in March, days before his re-election in the presidential elections, Putin demanded that the bridge be finished by May "so that people can take advantage of it during the summer season." At that time Putin also stressed that the last Russian czar, Nicholas II, also had the project to build a bridge to the Crimean peninsula from Russia, "but the First World War did not give him the opportunity," he recalled. Cars and buses will be able to access the bridge from May 16, according to the Kremlin. The trains will have to wait until the end of 2019. The bridge includes four lanes for vehicles - two in each direction - that will be open to the public early in the morning, and two train tracks - one in each direction - that are expected to be completed by the end of 2019. The bridge, which passes through the island of Touzla, will have a height of 35 meters in the part of the central arch. Vehicles can travel up to 120 km/h if time permits, according to the Russian news agency RIA Novosti. The construction of the bridge to connect Crimea with mainland Russia without going through Ukrainian territory was one of Putin's promises after the annexation in May 2014, after a referendum on the peninsula not recognized by Ukraine or the international community and a military intervention bloodless. The "Crimean Bridge", very symbolic for Vladimir Putin, will contribute in principle to reducing the geographical and economic isolation of Crimea, which Russia annexed to its territory in March 2014 after intervention by Russian special forces and a referendum denounced as "illegal" by Ukraine and the Western powers. Because of the blockade imposed by Kiev and the Western sanctions that followed the annexation, most of the food products arrive from Russia by ferry, a delivery system that depends on meteorology, which has sometimes led to shortages. Crimea also depends on the airway for its supply, so that current consumer products have gone up a lot of price. The work of the "Crimean Bridge" constitutes a violation of the territorial integrity of Ukraine, considered the Court of Justice of the European Union. In early May, the Netherlands announced the opening of an investigation into the alleged involvement of seven Dutch companies in the construction of this bridge, considering that under European sanctions against Russia, they could not participate in the work. For the Russian president, the inauguration of the bridge is not only a technical feat, but also represents a historic milestone. "Many people did not believe in the viability of these plans, and Putin demonstrated once again that the most ambitious plans can be made under his direction," Peskov said. The advance on the graph established at first for the construction of the highway is due to the difficulty of access to the peninsula, hitherto only by air or ferry, has been harming the tourism sector and the Russian president did not want to wait one more summer for the Russians to move there in their private cars. Crimea is a very popular holiday destination among Russians, and tourists from that country are one of the main sources of income of that peninsula, highly appreciated for its beaches and mountains next to the Black Sea.